The QS3,000 Pro Santa Cruz 2018 pres. by Noah Surf House launched today in fun conditions with waves in the three-to-four foot range and side-onshore winds to complete the opening two rounds of competition. Capricious weather kept everyone on their toes during a long first day of competition but the waves were breaking all day, providing plenty of opportunity for good scores on two different peaks. Surfers could choose between the closer rip bowl left that finished in the shorey or a right-hander breaking out the back in more turbulent waters but with bigger sections. Brazil’s Samuel Igo De Souza chose the first option and built momentum in his heat with rail-to-rail carves and good turns on the punchy lefts inside. With a solid lead over his competitors, the goofy foot opted to go on a final wave in the dying seconds of the heat and put together an excellent two-turn combination for an 8.33 and the win. In his third year competing in Santa Cruz, the Brazilian still have some work to do to equal or better his best result of a 17th place at praia da Mirante. 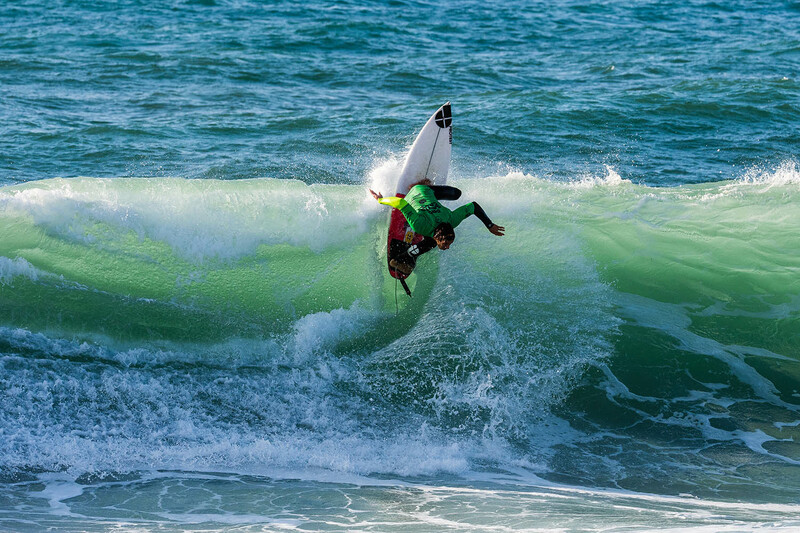 In his fourth year competing on the Qualifying Series, Newquay’s Luke Dillon (GBR) seems to have found a working formula as his form early on in 2019 is the best it’s been. After a slow start in the first two European events, Dillon went on to secure two good results in Brazil and Peru and comes back to the Old Continent revitalized and hungry for more precious QS points. The powerful regular foot opted to surf the outside bank in Heat 5 of Round 2 and lead all the way in a pressure-filled heat where all competitors were in striking distance of the pole position. Advancing alongside Dillon through to Round 3 was young gun Sam Coffey (USA), who actually had the heat’s highest single number, but a lower back-up. The California native with a low ranking had to start in the opening round and work twice as hard today to make his way out of the first day of competition. The 18 year-old from Santa Cruz who just graduated from high school last year is going after his first full term on the infamous grind of the QS, looking to build momentum and experience different places and cultures along the way. Pedro Henrique, Nic Von Rupp, Luis Perloiro and Pedro Coelho all advanced into Round 3 representing their home country of Portugal as well. Surfers and event officials will be back at 9a.m Tuesday to evaluate conditions and decide of the second day’s schedule.